Oh hi, did you want to combine the very best of the very best classic brunch buffet items — bagels and lox and deviled eggs — into a dreamy two-bite wonder? I did. So I did. For all of our deviled egg recipes, start with perfect hard boiled eggs. 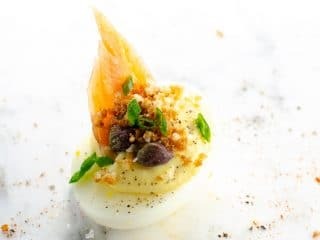 We incorporated all our favorite elements of a great bagels and lox platter into this savory, fun deviled egg variation. 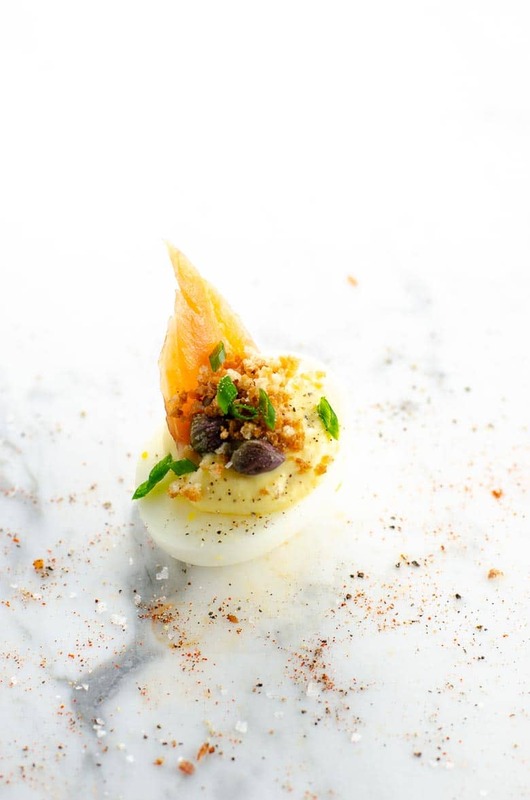 Bagels and lox deviled eggs are an equally good contender to prep and serve fully dressed, and also to include in a deviled egg bar where guests can top their own eggs with garnishes. These crowd-pleasing bagels and lox deviled eggs are full of flavor and protein. Begin with perfect hard-boiled eggs (and homemade mayo if you like, though to be honest I rarely do these days!) and this anytime buffet star will be ready in no time. Add mayonnaise, crème fraîche, mustard, salt, and pepper and continue mashing and blending with the fork until yolk mixture is creamy. Stir in shallot. In a small frying pan, melt the butter over medium heat. Add panko and cook, stirring frequently and watching carefully, until lightly browned. Let cool for a few minutes before proceeding. Shortly before serving, garnish each deviled egg with a small piece of smoked salmon, a few capers, a sprinkle of chives, and a sprinkle of toasted panko.